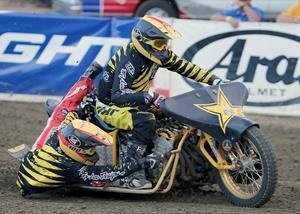 Proving once again that he is the man to beat in American speedway Billy Janniro dominated Division I Friday night at the Fast Fridays Motorcycle Speedway in Auburn Ca. inside the Gold Country Fairgrounds. 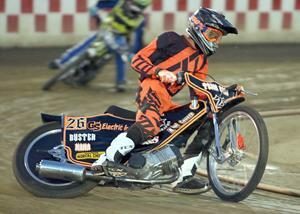 The eight time AMA US Speedway National Champion won both the handicap main and scratch main events in convincing style doubling up for the first time this season missing a perfect night with just one second place finish in his handicap heat race. In the handicap main event Janniro riding off the 60 yard line held off Jeremy Estes who starts on the zero line. Janniro worked through the pack with some classic moves to take the checkered flag. Estes was second and Chance Grove off the 10 yard line was third. 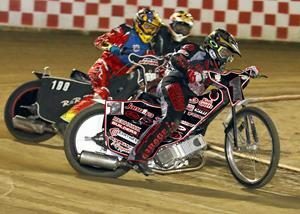 Grove just a second year speedway rider has moved from Division III last year to a Division I and rider to deal with who has easily adjusted to the tricky dirt track at Fast Fridays. In the scratch program Janniro was flawless with wins in his heat, semi and the main event. 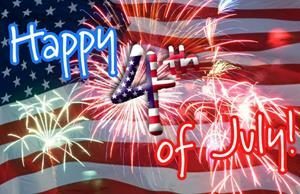 In the main event Janniro drew the outside, faced veterans Charlie Venegas in lane three, Tommy Hedden in lane two and Bryan Yarrow on the inside. Out of the gate Yarrow got inside on turn one and led for a short time until Janniro took over passing from the outside. Adding a little yardage with each turn Janniro kept control and crossed the finish line up on his back wheel. Yarrow tried but was unable to take the champ down and finished second. Venegas followed in third and Hedden was fourth. It was the second scratch main event win in two weeks for Janniro. In a new event this season Fast Fridays is presenting the TEAM SOS-Team Challenge. 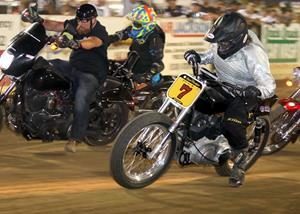 Two teams, Team SOS and Rocklin Harley Davidson will square off for five rounds throughout the season, each team accumulating points in each round with the season winner having the most points at the conclusion of the rounds. Six riders from each team race in three scratch heats scoring three points for a win, two for second, one for third and zero points for a fourth place finish. This week Team SOS jumped out in the lead with 10 points to Rocklin Harley Davidson’s 8 points. Its team racing with team captains Bart Bast and Billy Janniro selecting the riders from their rosters each week. The next Team Challenge will be on June 1. Aaron Sorani topped Division II Friday night after finishing third in last week’s division II main event. 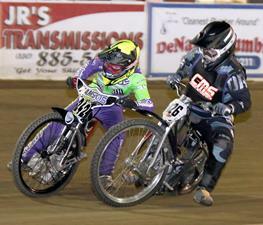 Sorani put it together Friday night with a win in his heat race and a win in the main event. Sorani has moved up recently to division II and is pulling double duty also competing in Division III. “That was fun, it was probably my best ride of the night (main event), this is my first season in Division II,” said Sorani. In Division III Meadow Vista’s Sammy Tetrault is really turning heads. 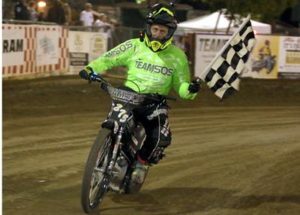 Up from the youth division this season and now on a 500cc bike and a member of Team SOS, Tetrault has won the Division III main event two weeks in a row, moving back yardage each week and next week will start on the 40 yard line. Finishing second in his heat race to Dakota VanderBroeder, she challenged him in the main only to take a fall and finished second. “I will probably get move up in the next couple of weeks,” said Tetrault. “I might also stay in D III all season and just ride heat races in division II.” Steven Sagen was third. Look for Tetrault to be mixing it up in Division II before long. 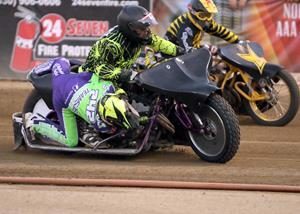 After a second place finish last week Auburn’s Cameron Krezman put it together this week with a win in the Youth 250cc main event. Aidan McNutt was second and Anthony Dion third. 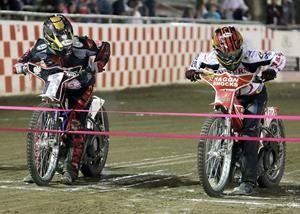 Enzo Sorani pulled off a win in the Youth 150cc main event making it a win-win night and party time at the Sorani household for father and son. Enzo’s father Aaron Sorani won the Division II main event. Greg Moore was second and Charlie Trana was third. On top of his game, Billy Janniro dominated both the handicap and scratch programs winning both main events. Bast-Billy Janniro (left) and Bart Bast (right) line up for the scratch semi-final race. 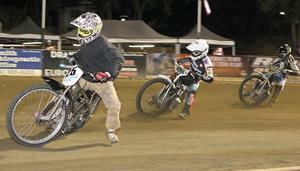 Auburn’s Cameron Krezman won the Youth 250cc main event. 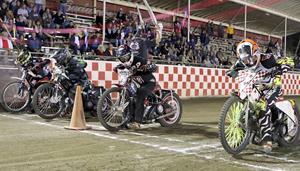 The start of the scratch main event Friday night. (left-right) Billy Janniro, Charlie Venegas, Tommy Hedden and Bryan Yarrow. Janniro won from the outside in the night’s finale. Sammy Tetrault on the winner’s podium getting a couple of kisses from the Fast Fridays trophy girls. 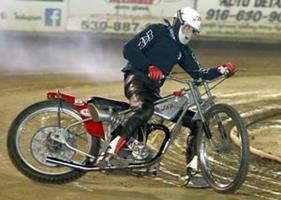 Tetrault won the Division III main event for the second week in a row. Sammy Tetrault (left) and Jake Estes (right) go at it in the Division II main event. Tetrault finished first and Estes second. 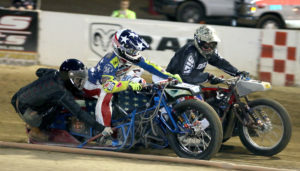 -(left-right) Tyler Warren, Daniel Faria and Chance Grove in the handicap main event.